Paraskevi is a female Greek name, deriving from the homonym Greek word paraskevi, which means preparation. Paraskevi is a name that was first used in the early Christian years. An alternative spelling of name Paraskevi is Paraskeui. It is the female respective name of Paraskevas. Agia Paraskevi was born in Rome during the reign of Emperor Antoninus. She was the daughter of Christian parents, Agathon and Politia, who made sure that their daughter would receive Christian education. They named her Paraskevi, because she was born on Friday (in Greek the name of Paraskevi). When her parents died, Paraskevi gave all her fortune to the poor and started helping people in need in Rome and elsewhere, teaching the word of God. Her actions provoked the reaction of Antoninus who had her arrested and promised her much wealth in the case she wanted to adopt the pagan symbols again. Paraskevi denied and had to suffer the torture of a flaming helmet. However, she accepted this torture as well, without changing her faith and beliefs. Then Antoninus ordered to put her in a barrel full of warm oil. But again, Paraskevi did not die. Antoninus was so surprised that he decided to see whether the oil was hot enough, and he approached so close that he got blind. Paraskevi prayed to God to give Antoninus his sight back, and indeed that happened. According to the legend it was then that Antoninus stopped persecuting the Christians. Paraskevi was freed and allowed to teach the Gospels in Greece. Later, in Tempi area close to Thessaloniki, a pagan tortured Agia Paraskevi brutally and had her decapitated. 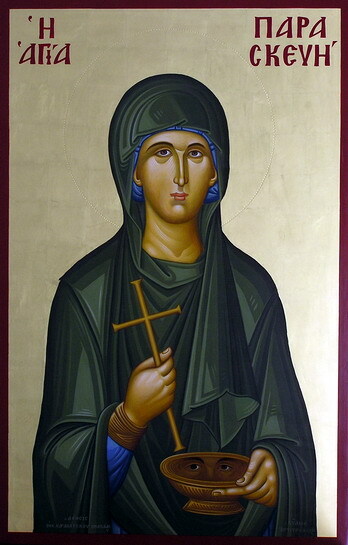 The Orthodox Church declared her a saint, celebrating the nameday of Paraskevi on July 26th. Name Paraskevi features just a few nicknames and diminutives, such as Evi, Voula, Vivian, Vivi, Veti, Veta, Paraskevoula. Paraskevi is a kindhearted womqn, who is always willing to help other people. she is a woman that likes having a family and usually has many kids. Hey I’m a woman and my name is Paraskevi. I’m just wondering, why do you only mention the man St. Paraskevas, and not mention the female St. Paraskevi of Rome, whose nameday is celebrated on July 26? Just wondering…she’s an important saint, you shouldn’t leave her out.